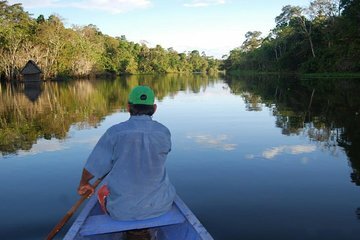 Bli en Amazon jungle explorer på denne 4-dagers, 3-natters utflukt til en jungelhytte som ligger dypt innenfor denne berømte skogens grenser. Scout for lokale dyreliv som dovendyr, apekatter, fugler, caimans, piranhas og mer når du liker elvebåtturer, besøke en Amazonasby, og nyt atmosfæren i dette utrolige utendørsmiljøet. De fleste måltider og overnatting er inkludert. Truly a once in a lifetime experience! Muyana Lodge goes above and beyond to ensure that you have the ultimate jungle experience whilst truly pampering you to make sure your stay is as comfortable as possible. The itinerary is so varied and allows you to experience many different areas of the jungle. If you are lucky enough to have Donaldo as your guide you are in for a treat. He is so talented and made up a large portion of why this trip was so good for us! Could not recommend this excursion more, it is worth every single penny. Really awesome guides and sights! Absolutely unbelievable, My wife and I had an incredible time, everything about this tour was perfect, from the food, the day and night treks, playing soccer against a local village. To most importantly our amazing guide, Donaldho, who has a contagious passion for the jungle and his work and made us feel safe and intrigued the whole time we were with him. I would 100 recommend the tour to anyone. Truly a lifetime experience! !